It all started with a text message from my Stepdad. Then a phone call with him. Then a phone call with my Mom. Then before I knew it, we had agreed to buy a plant (sight unseen) that was over 6 hours away at the time of purchase. Seriously. We might have a plant buying problem. We are so bad, we even have little plant scouts that we didn’t even know were on the payroll. So what was the plant you wonder? Only the coolest plant on the earth… the Agave Neomexicana. 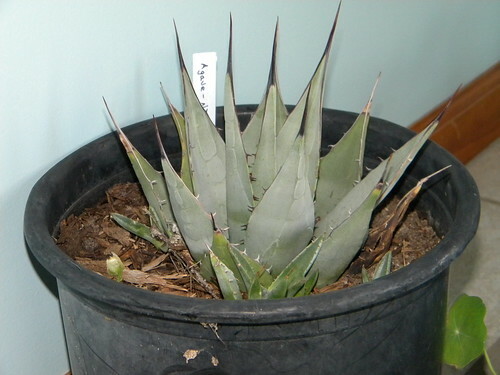 For those that don’t speak latin/mexican/plant – thats an New Mexican Agave. Ok, it might not be the coolest plant on earth, but it is one we have big plans for. There is a bare spot on our back fence that would be AWESOME if it grew gigantic and filled. The guy told my parents that it might get as big as 16 ft tall (shiii… not the way we grow plants, it will be lucky to be alive), and will shoot a candelabra like spike (you know how agaves do). Should do good in our climate, should be easy to take care of… if it just liked beer & BBQ it would fit in perfectly. Anyone have some new plant babies to show off? This is our first big purchase of the season… but it is early, so expect TONS MORE soon. Next Next post: Ready For Some Giveaways?! ?